The urbanite run was definitely a good experience for most of us in GRC as it was our first night race. Likewise, more members took the 15k distance and im happy to see their progress. Also, we have new members who ran their first official race (Tiffany, Zelyn, and Perly) who ran their first 5k, (Darwin and Mark Hendrix) who ran 10km. 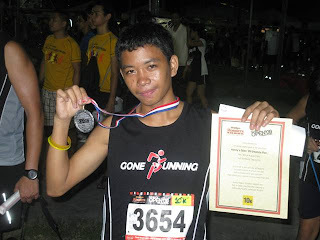 And most of all, it was a memorable race for us since our very own Greg won the 2nd place at the 10k category. Let me share some insights on this event. 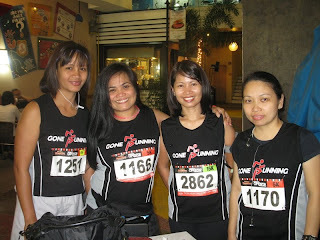 We have learned our lesson during the Run for Home event which was also organized by Finishline where I had some argument with one of the staff during the claiming of Marvin's race kit as he was not able to get it during the designated pick up time. This time, we made sure that everybody registered early so that there will be no last minute problems. However, there were still some glitches as we ended up going there twice to pick up our race kits. Since we are all from the South, one of us (Jojo) volunteered to get all our race kits last Thursday. Unfortunately, he was not able to get the rest since it was not yet available (that includes mine). The next day, Cherry went to claim the rest of the race kit, but without the singlets. We ended up getting the singlets on race day and guess what, I didnt get the right size as they ran out already. Not blaming the organizers, but i guess they have to learn from this as well and maybe put more attention to planning and improving their logistics. I believe they can better this in their next event. There were a lot of runners participating in all categories. I must say that the event was well supported by the runners considering that it was also the first night run to be held this year. I was planning to make a PR in this event but i had to change plan since I was not feeling well. But the excitement was just off the hook, I was running at 6:00/min for my first 2km, but then again, I had to pace myself cause I knew I wont have enough gas to sustain. The route was difficult cause of the uphill, there were a lot of runners walking and that made me felt like walking as well. I got distracted by both runners overtaking me and those that were walking. I lost my focus for awhile there and it becomes so difficult to run. On my 7th km, it was difficult running uphill when suddenly a familiar voice said, "GO CHIEF! ", it was my buddy Jay who was on his 12th km. I suddenly had my adrenalin pumping again and ran beside him, and then Val showed up in a minute and the three of us were running side by side for a while. Felt strong and they allowed me to go ahead (after all they ran 12km already, and its my 7th). I had to stop on the hydration station to refill. But this slowed me down and find it hard to catch up. Lessons learned, bring your own hydration pack. Greg, was just so strong that the only time I saw him was at the starting line and after that, off he went and finally winning 2nd place. I remember him promising the group that he will get a place in his race, and so he did. Congratulations Greg! As I reach the finish line, I tried to sprint my last 50m (hehe) taught of picking up the pace at my last 200m but legs just can't do it. I felt exhausted but was happy that I still managed to finish it at a reasonable time though not getting a new PR. As I went to our meeting place, there I saw Kay patiently waiting for the Knight. Always caring she offered me a drink and a hug. She told me that Greg was the first one to arrive from the group and that Greg won 2nd place. I was happy and congratulated Greg and so did the rest of the group. We waited for the rest to the finish line and then had our picture taken again. We then went to cheer Greg as he get his award! 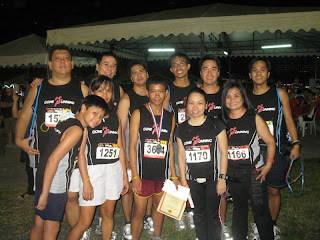 The group was very proud of him and he definitely motivates everyone to train further and enjoy running. Overall I think it was a good race, had enough hydration station, markers, and marshalls in place. I would like to acknowledge the efforts of finishline for this event. I know in the future races, they will be able to improve further and give everyone a good running experience. 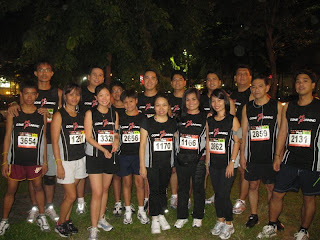 As for the group, aside from the support to Hands on Manila and 57-75 Movement, we all ran for our advocacy. Total Run Against Corruption in this event - 180km. Greg all smile with his accomplishment. Hi Mark, wow your friend Greg is amazing! How young is he? Hi Natz, he's 17yrs old from Aklan, he's now based here in Laguna.. Very determined guy.. 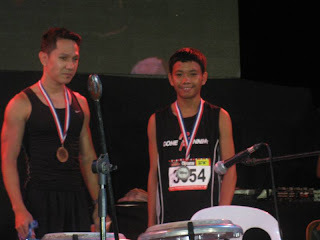 Thanks for stopping by..
Hi Mark, Junrox here.. Congratulations to all especially to Greg and first-timers in road race. Urbanite route is not an ideal race for setting PR, Bayanihan rd and Mckinley hill is a killer combination. I also had several walkbreaks during the race. thanks for stopping by and welcome to the group. Hope to see you in one of our runs. 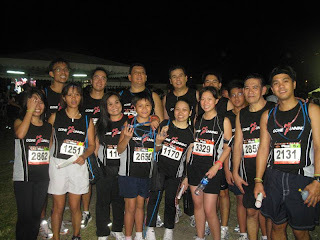 I plan to do LSD this coming sunday here in Laguna, let me know if you guys will be running. I know you are planning to run in Baguio though.